BEIRUT (CNS) — Catholic patriarchs in the Middle East, in their Easter messages, appealed for peace in Syria and expressed hope that the region would experience a resurrection. “I want Damascus and the whole of Syria to live again the joy of (St.) Paul when he met Christ, risen from the dead, at the gate of Damascus,” the patriarch said in his Easter message, issued ahead of the April 20 feast. 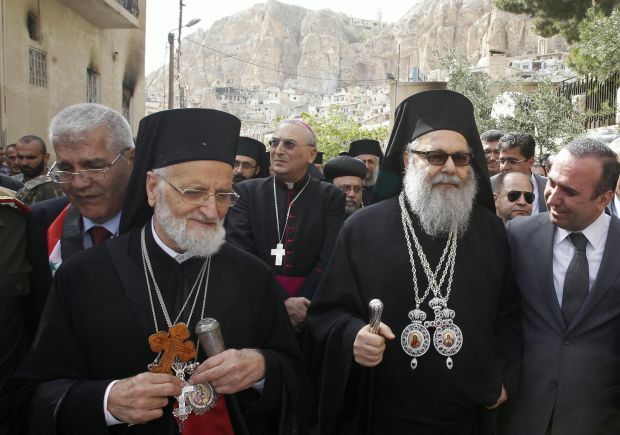 On Easter, he visited the ancient city of Maaloula, Syria, with Orthodox Patriarch John X of Antioch and all the East. “We don’t want any more martyrs,” Patriarch Laham said in his message. “We don’t want any more orphans! We don’t want more widows and more mothers losing their children! We don’t want any more millions of children traumatized! Enough wounded! Enough handicapped, mutilated or disfigured! Enough of people haunted by fear, hatred and bitterness! Enough kidnappings and extortions!” the patriarch said. He appealed to the world “in the name of the poor, weak, widows, victims, mortally wounded, mutilated, disfigured, displaced persons, refugees, homeless, hungry, children, the elderly, pregnant women, handicapped, all those in despair, pain and discouragement — such as I often encounter at the Syrian-Lebanese border when travelling from Beirut to Damascus, or during my visits to families of victims and disaster-stricken people. They are burdened by fear about the future and the fate of their families, children and young people. “Love will rebuild Syria, which will be thereby renewed. That is what Jesus teaches us in his Gospel,” he said. “Innocent people, particularly vulnerable and targeted Christians, continue to suffer in the Middle East and most particularly in Syria and Iraq. They are suffering because of violent hatred exercised by many militant religious groups that are often tacitly even openly supported by Western politicians,” Patriarch Younan said in his Easter message. “Hundreds of thousands among Christians have been targeted and forced into exile inside their own country or had no other choice than to emigrate. Many among them are clergy members and faithful who have been abused, kidnapped or killed because they represent a minority still believing in the Gospel of love, justice and peace,” the patriarch said. He said the violence would not have happened without people looking for economic opportunism. “Let us hope that one day, with the prayers, courage and effective solidarity of the silent majority of our Christian brothers and sisters in the Western world, peoples of the Middle East (will) rediscover their true calling to spread God’s love and reconciliation for a better world,” he said. “And with them and with the people of these countries we hold dear, we raise our prayers to God for the innocent victims and the wounded, and for the families affected and displaced and homeless at home or abroad,” the cardinal stated in his message. “We ask Christ the victor over sin and evil and death” to touch the consciences of those responsible, “and stir in their hearts love and compassion,” he said.